The Catch is a towable back-up device conforming to EN 12841:2006 Type A. 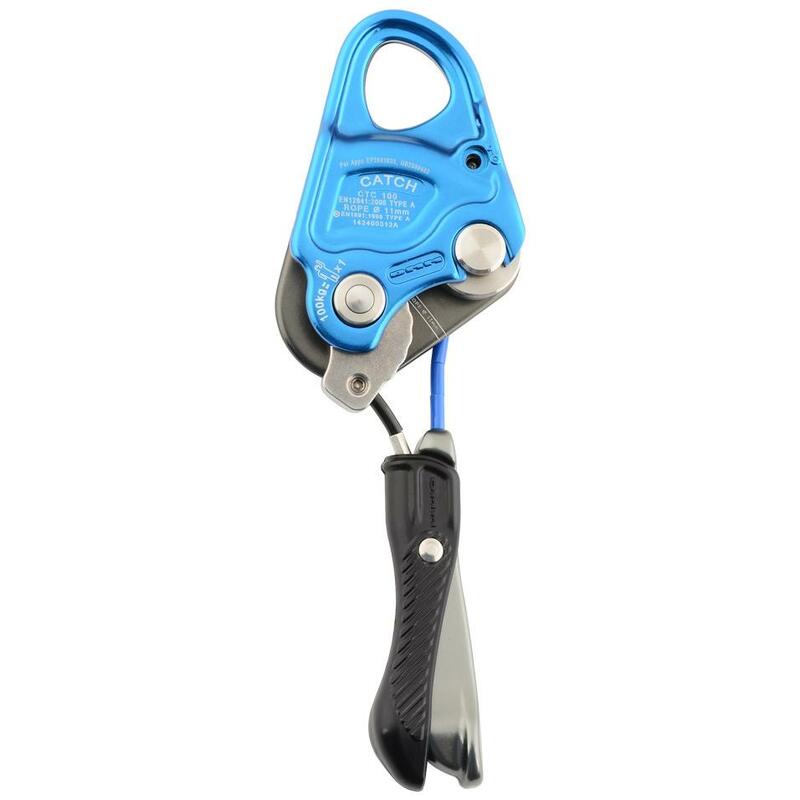 The device features a non–aggressive stainless steel cam which is spring loaded allowing it to be positioned on the rope while the user is working. The Catch incorporates a patented Towable Release Mechanism (TRM). The TRM allows the user to tow the Catch whilst descending, yet will enable it to lock onto the safety line in the event of a main line failure or uncontrolled descent. The TRM has a unique function that will lock the Catch onto the safety line should the user panic and grip the device during an emergency. The Catch has undergone extensive field testing, including real person main line failures and uncontrolled descents, ensuring our system offers a significant step up in safe working with towable devices. For use on approved 11mm diameter ropes complying with EN 1891:1998 Type A or NFPA 1983 (2012), with a maximum lanyard length (including connectors) of 800mm. This lanyard can be constructed using dynamic cowstails, textile or wire rope. The TRM allows the Catch to be towed whilst descending, whilst providing a safety system that will allow the Catch to function and hold a fall should the user panic during an emergency and grip onto the TRM, rather than releasing it. The release mechanism has been designed to be comfortable for all hands sizes, and in all configurations whilst working. The cam and boss that provide the locking function onto the rope have been designed to minimise wear on the rope, to maximise lifespan of the Catch and to provide total security during use. Maintaining a constant angle between the cam in the device and the rope will ensure the device will operate correctly during use. The Catch has been extensively tested on a wide range of 11mm ropes here at our test tower in DMM. Please see the user instructions for a list of approved ropes. Use the Catch with lanyards of your choice up to 800mm long (including connectors) in single use mode. For rescue scenarios it is recommended to keep the fall factor as short as possible, which can be helped by shortening the lanyard, and to please read the instructions for further details. The Catch does not require a shock absorber to be part of the lanyard. The device can be bolted into a closed position, should you require it to be attached to a safety line and for it to remain in place. For example, on a fixed line at a high ropes course it can be locked onto the rope for each user to clip as needed. The device has been designed so that it contains very few moving parts and that it can be opened to allow access to these parts, which makes it very easy to clean. Easy access and careful design also make the device simple to inspect. The device can be tethered using a cord tied through the appropriate hole in the body. It can also simply be clipped on one side when open, allowing the user to install/uninstall from the rope whilst still remaining attached to the device in case it is accidentally dropped. An overview of the features and benefits of the Catch.